This jawbone was created from adult stem cells. Like Samson, researchers in the field of stem cells have used the jawbone to make a point. Dr. Gordana Vunjak-Novakovic and her team at Columbia University have manipulated adult stem cells to grow one of the most difficult sections of bone to replace, the temporomandibular joint. This jawbone was created by allowing pluripotent cells harvested from marrow to grow in a scaffold that was fashioned to mimic the TMJ’s shape. 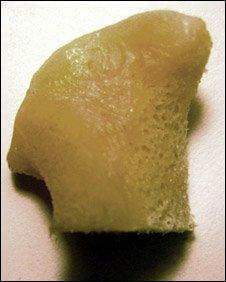 It is the first accurate and anatomically sized bone created by stem cells in a lab. Dr. Vunjak-Novakovic hopes that this new creation will serve as a proof of concept — if they can make the complex TMJ, they should be able to grow many other bones in your body. While this work is truly amazing, it still has some major hurdles to jump before it could be used to replace damaged or cancerous bones in humans. While stem cells have been hailed as providing wondrous treatments for illnesses, it is their ability to form into completely new organs that is truly miraculous. We’ve seen the creation of organs such as the bladder, and even witnessed the beating of an artificially grown heart, but the work at Columbia University is the first development of bone. Slowly but surely, it seems that we are developing the means by which every portion of the human body could be replicated or grown in a lab. This may one day lead to the creation of entirely new bodies for those damaged irrevocably, or even for the recently deceased. The work of Dr. Vunjak-Novaokovic and her team was published in an article in the Proceedings of the National Academy of Sciences. She is quick to point out while the TMJ joint has all the correct proportions and shape of the real thing, it only contains bone cells. Cartilage, tendons, etc were not grown along with the jawbone. This means that the team has quite a few structures to build, and likely years of research to accomplish, before functional bone donations could be created in the manner described in the article. The team is already planning on how to produce hybrid grafts of bone and cartilage. Growing a fully functional part of the human body depends not only on coaxing adult stem cells to replicate and specialize, it also requires one heck of a nursery. The Columbia team has developed a bioreactor which provides all of the necessary nutrients for stem cells to develop into bone. The shape of the scaffold inside the bioreactor was defined through the use of many digital pictures. Which raises the possibility that eventual bone recipients could have the new body part made to look exactly like the old one. While the bioreactor is top notch, work still has to be done to find a way for the newly created bone to carry its own blood supply that can be easily adapted into the host. The work at Columbia is part of a larger network of worldwide specialists who are interested in generating human tissue from scratch. The Sydney University Tissue Engineering Network has its 3rd annual symposium on November 9th. Work in this field promises to one day provide humanity with replacement parts grown from their own cells. Not only will this relieve tensions in organ donations, and hopefully nullify the organ black market, it may provide us with the means to generate new bodies as our current ones wear out. While we are certainly years if not decades from such an ability, the work by Dr. Vunjak-Novakovic implies that no bone is beyond our means to replace. It’s a good start.